This Brentwood Home Cedar mattress review takes a look at the new natural latex and microcoil hybrid mattress that Brentwood Home recently released. The Cedar is Brentwood Home’s all natural luxury hybrid mattress that was developed to meet the growing demand for all natural mattresses made up of environmentally friendly materials at an attractive price. Brentwood Home is known for their high quality latex, memory foam, and hybrid coil mattresses, which use premium materials and design features such as New Zealand wool and Belgian knit, custom handles, and elegant tufting. We have reviewed several of Brentwood Home’s past models, and always been a big fan of their quality products that are a great value for the money. All of the premium materials and design elements really set Brentwood Home mattresses apart from the vast majority of “me-too” Bed-In-A-Box mattresses on the market today. In addition, all their products are hand made in their own manufacturing facility in Los Angeles. The Brentwood Home Cedar is a 13″ latex and pocketed coil hybrid mattress mattress. It is a “green” mattress that is made up of all natural materials including natural latex, GOTS certified organic cotton fiber without chemical adhesives, organic coconut husks, New Zealand wool, and natural flaxseed. 2″ Latex Layer – This layer is 2″ of natural Dunlop latex that provides comfort and responsiveness to the mattress, pressure relief, and combines with the grooved latex layer beneath for support and cooling the mattress. 2″ Latex Comfort Layer – This layer is made up of another layer of 2″ of grooved Dunlop latex that is cut into 3 separate zones that provides comfort and support for the body as well as aids in ventilation and airflow to provide a cooler sleeping environment. 8″ Support Layer – This layer is 8″ of individually wrapped coil system which provides the core mattress support and deep compression support for the body during sleep. Reinforced coils in the lumbar region provide support for the lower back, and edge retention coils provide edge support as well. 1″ Base Support Layer – This layer is 1″ of organic coconut husks which helps with circulation and has anti-microbial properties. The Cedar has a very nice exterior cover made of organic cotton that is hand tufted and is naturally pesticide free, eco-friendly, and quilted with natural fire-retardant silica sand. It covers a layer of New Zealand wool that wicks away moisture, allows for air circulation, and provides temperature regulation naturally via wool’s natural temperate regulating properties. The mattress has organic cotton tailored tweed sides, and custom handles. The Brentwood Home Cedar is a latex / innerspring coil hybrid model, and comes in a medium firmness option, which we rate at a 6/7 out of 10 (10 being the firmest). As I am significantly heavier than Kaye, I tend to press through the top comfort layers on most mattresses and feel the support layers more often than not. However, being that the Cedar is made up of latex in the top layers, which provide more response and push back than foam mattresses, i felt the typical feeling of “floating on top of” the mattress, combined with the bouncier feeling of the supportive pocketed coil springs in the mattress. This is typical of latex mattress and latex hybrid coil mattresses in particular, which provide that feeling of “sleeping on top of” vs “sleeping in” the mattress (when compared to memory foam construction mattresses). In terms of support, the Brentwood Home Cedar mattress does a really good job of providing excellent support in all sleeping positions. It is soft enough to be comfortable but still supportive where we didn’t sink too down in the mattress, causing hip or shoulder pain which some softer mattresses tend to do and which as stated, is what latex / coil hybrids are known for. The micro coil construction and latex layers really provide a high degree of bounce and responsiveness with the Cedar, and the nice thick 13″ design really supports heavier sleepers such as myself quite well. The Cedar is a very comfortable mattress, and the premium materials all lend themselves to accomplishing this. The soft cover with the quilted layer of organic cotton provides a very comfortable sleeping surface, and the latex and coil layers combine to give the Cedar a comfortable top sleeping surface, with a good amount of responsiveness and bounce. Both Kaye and I really like this mattress quite a bit, in that it is so much more far removed from the majority of the beds we have tested to date here at Memory Foam Talk. Brentwood Home really sets themselves apart from the majority of “Bed-in-A-Box” mattresses by using such premium materials in their mattress such as the New Zealand Wool, organic cotton, organic coconut husks, and the multiple latex and pocketed coil layers in its construction. For customers looking for an all natural mattress that uses premium materials at an affordable price, the Brentwood Home Cedar is a great mattress that meets all these requirements. The Cedar is priced at a premium compared to many other mattresses on the market but it really delivers with high end materials, quality construction, and the fact that the mattress is manufactured by hand at their own manufacturing facility in Los Angeles. The Cedar sleeps quite cool due to the multiple layers of latex, pocketed coil springs, and the layers of organic cotton and New Zealand wool in the top cover. We did not get the sticky sweaty feeling that some mattresses cause during the night, as the various materials used to keep the mattress cool do a good job at preventing heat buildup. This is a result of the natural properties of latex and wool, combined with the air circulating properties that hybrid coil mattresses deliver. The Brentwood Home Cedar mattress does a good job with sinkage, however due to the coil and latex design there was a decent amount of motion transfer. As we always preach, sinkage (and motion transfer) is largely weight dependent. The fact that I (Andrew) weight around 230lbs tends to have a rather large bearing on the degree of sinkage I experience when sitting and lying on a mattress. Kaye, who is half my weight, experiences much less sinkage, naturally. There was less sinkage for me with my weight compared to many mattresses we have tested. The layers of latex and coils did a good job at preventing me from sinking down too far into the mattress, which is a good sign. My weight (and our combined weight as a couple) on the coil and latex construction of the Cedar caused us to bounce a bit on the mattress when adjusting positions. This was a factor when both sitting upright as well as lying on the mattress when sleeping. Edge support was good even with my heavier weight, as I didn’t compress the mattress down as much as usual which is good, and even less so for Kaye, who weighs half what I do. When I slept closer to the edge of the Cedar, I did not get the sensation of “rolling off” the edge, due to the comfort layer compressing under my weight – which is a definite plus. Due to the thickness of this mattress (13″) , I also did not sink to the foundation when sitting on the edge of the mattress which is another plus and attractive feature of this mattress. As for motion transfer, the construction of the Cedar, with the bouncy latex and coil construction, caused some motion transfer between both Kaye and myself when sleeping and changing positions during the night. We did feel each other move around and get up during the night, as my heavier weight would move the mattress to a decent degree. This is more a function of the materials used and their high degree of response than any fault with the mattress per se. The Brentwood Home Cedar gets high marks in this category for not having a noticeable smell upon opening the box. This is one major benefits of an all natural mattress, which does not contain chemicals or petroleum by-products in foam and thus does not have the associate smell. While this is higher than most of the mattresses we have reviewed, you really get your money’s worth with the degree of quality and materials used in the construction of this bed. The Brentwood Home Cedar mattress is an exceptional mattress and one of the best ones that we have slept on out of all the ones we have reviewed to date. The all natural construction that is eco-friendly made up of natural latex, organic cotton, New Zealand wool, and individually wrapped steel springs is a great choice for those looking for an all natural mattress. Brentwood Home has done a great job with the Cedar as their top-of-the-line natural latex hybrid mattress, and it shows from the high quality construction and materials used in this great bed. The comfort and support provided by the mattress’ design is excellent, providing a nice comfortable layer on top with the support needed for both my heavier weight and Kaye’s lighter weight. The responsiveness and bounce provided by the latex and micro coil design makes for a comfortable yet supportive night sleep, and the mattress sleeps cool due to the inherent properties of latex, organic cotton, New Zealand wool, and the individually wrapped springs. All in all, we feel the Cedar is one of the best latex hybrid mattresses on the market today and one of our favorites. If you’re looking for an all natural mattress, and have the money to spend on one of the best, then we highly recommend the Brentwood Home Cedar. We hope our review of the Brentwood Home Cedar mattress was helpful, and if you have any questions feel free to let us know! Read the full Brentwood Home Cedar vs. Avocado comparison. Read the full Brentwood Home Cedar vs. Zenhaven review. Read the full Brentwood Home Cedar vs. Spindle comparison. 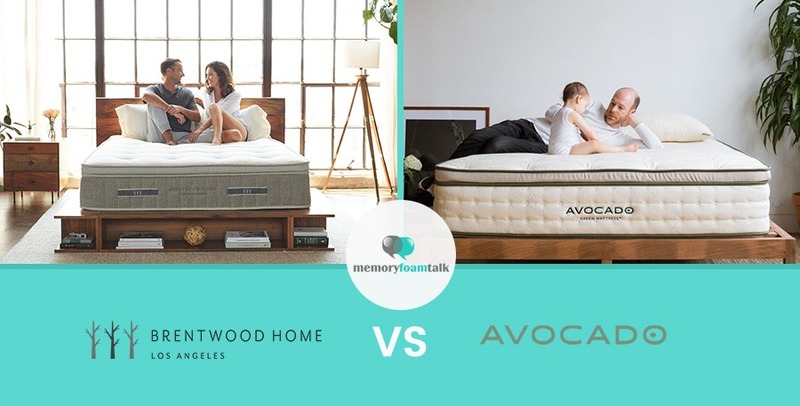 Click here for more Brentwood Home Cedar mattress comparisons.